or there may be a workshop that includes a tour of Earthship Ironbank. No unannounced visitors please as there may be guests in the Earthship or we may not be available to give you a tour. Radio Adelaide "Mornings" show, interview with Spence Denny, 28 November 2017, regarding Earthship Ironbank. http://www.abc.net.au/radio/adelaide/programs/mornings/mornings/9178172 fast forward to 1:17:47 for beginning of Earthship story. Earthship Ironbank on TV: Totally Wild, 21 November 2015: http://tenplay.com.au/channel-eleven/totally-wild/season-23/episode-57 approx 15min 12sec into the episode. Hello! Welcome to the Earthship Ironbank website. Earthship Ironbank is located in Ironbank (please note its BaNk not BaRk), a semi rural location about 30-40min drive South East of Adelaide, Australia in the City of Onkaparinga council zone. It is a bed and breakfast (tourist accommodation) open to anyone who wants to experience Earthships, and a test site where my Earthship research continues - how energy and water efficient are they and do they work in our climate?? (see Research page). Earthship Ironbank was started in 2009 at the drop of a hat. 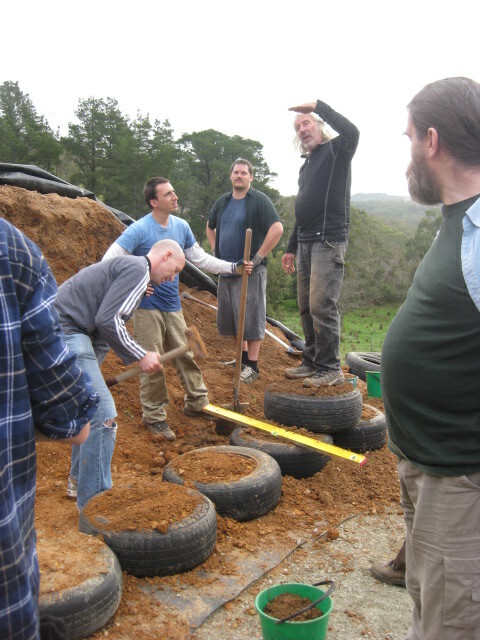 Mike Reynolds was in town (pictured below at Earthship Ironbank - he's the guy standing on the tyres) and it seemed like a great opportunity to start something. He led a team of about 25 people with some tyre wall construction and after about 3 hours we had 60 tyres pounded and a wall about knee high. See the Workshops page of this website if you are interested in learning about Earthships and helping with construction. After umming and ahhing about how the little tyre wall could turn into something amazing, we had a discussion with council and decided on a Bed and Breakfast which was pretty much all council would allow due to us already having our Strawbale home on our block of land (about 4 acres). It took about 1 year for me to draw up the plans and get council approval and by July 2013 we had full development approval. I also had approval from Mike Reynolds, this being the first (and perhaps only?) Earthship project in Australia "sanctioned" by Earthship Biotecture. Approval was actually remarkably easy. Council didn't have a problem with approving it on "planning" grounds - we are in a semi-rural area so that helped - and "building approval" was also a breeze once I had found the right engineer and private certifier. The private certifier was not concerned about the tyre walls (with no footings), as the engineer had done calculations to prove they would work. One thing was a bit tricky - the indoor greywater system, and despite making a proper application to the authority, SA Health, we were not permitted to install the system. Regardless, the system was installed, tested and then "decommissioned" by removing the three way which is the heart of the system that enables the user to direct the water either to the greywater planter (not allowed in SA) or out to the septic tank (this is what the law requires). You can actually see the three way valve in operation in the Totally Wild video (link above) which was filmed prior to occupancy of the Earthship and prior to it being removed. It can be easily reinstalled if and when the laws change - and I think they will, as climate change starts to hit hard here in South Australia, the driest state in the driest continent. SA Health were mainly concerned about; potential smells in the home, people coming into contact with greywater by digging in the garden, and, even though I might be able to use the system safely, future owners of the building might not pay attention to maintenance and operation issues which might lead to health risks. It's frustrating that it is not allowed as we know from all the pioneering work done by Earthship Biotecture that these systems are user friendly, low maintenance, and work wonderfully well! Over the summer of 2013/14 about 60 wild and wonderful people helped build Earthship Ironbank. These were the first of many amazing volunteers who made this building. As of November 2016 it is officially complete - we actually have a Certificate of Completion. There are more Earthship projects planned so please sign up for the email newsletter on the Contact page if you are interested in future workshops. There is also an Earthship Ironbank Facebook page. If you want an Earthship please consider my sustainable design consultancy Earthship Eco Homes, which aims to assist people with design, approval and construction of their Earthship. There are various projects at different stages so see the Projects page for some info about these exciting projects. 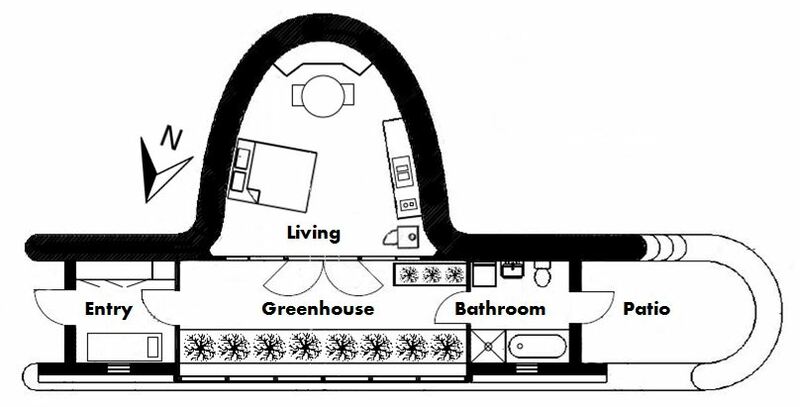 Earthship Ironbank floorplan - it is designed for two people. The main room has a kitchenette, table for two, queen size bed, and a slow combustion heater. There is also a bathroom with tadelakt bath, entry room with day bed, greenhouse with garden and an outdoor patio area.